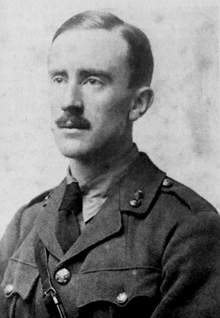 J. R. R. Tolkien (1892-1973) at age 24 in army uniform. Photograph taken in 1916. Tolkien was best known as the author of The Hobbit, The Lord of the Rings, and The Silmarillion. Frodo, Bilbo, and Gandalf are characters (variously) from The Hobbit and The Lord of the Rings. Photo courtesy Wikipedia. A skip-level interview is a dialog, usually private, between an employee and the employee's supervisor's supervisor. Skip-level interviews can be initiated either by superiors or subordinates. When they're used properly, they provide benefits to all concerned. For example, when a subordinate is troubled by the policies or behavior of the subordinate's supervisor, a conversation with the supervisor's supervisor enables the subordinate to register concerns and seek corrective action if appropriate. Alternatively, when supervisors want a more complete and unfiltered view of the operations of groups within their areas of responsibility, conversations with subordinates of their direct subordinates can provide them with a fresh perspective. Nevertheless, with these benefits come hazards. Some risks apply to skip-level interviews initiated by supervisors, and others apply to skip-level interviews initiated by subordinates. Here's a short catalog of some of the risks associated with supervisor-initiated skip-level interviews. In what follows, the subordinate is Frodo, Frodo's supervisor is Bilbo, and Bilbo's supervisor is Gandalf. Some supervisors use skip-level interviews to gather information they intend to use in termination proceedings against their direct subordinates. For example, if Gandalf suspects that Bilbo isn't actually present during periods when Bilbo is expected to be at work, Gandalf might interview Frodo and ask a series of questions intended to determine whether Bilbo's work hours have been in line with Gandalf's expectations. termination proceedingseven if Gandalf words his questions cleverly. Indeed, even if Gandalf asks no questions, but merely steers the interview toward the topics he wants to cover, Frodo might detect Gandalf's agenda. Skip-level interviews must therefore be agenda-free. Gandalfs everywhere would do well to listen, rather than speak. Supervisors who bring agendas to skip-level interviews are likely to exacerbate any problems that already exist, at best. Worse, they might create problems where none existed. If Gandalf habitually brings agendas to skip-level interviews, Bilbo has few options for defending himself. He can brief his subordinates about skip-level interviews in general, and about the dangers of prior agendas. He can warn his subordinates that if they detect Gandalf's agenda, and decline on principle to supply information that supports it, they might be at risk themselves. On the other hand, they cannot get much protection for themselves by offering flimsy, false, or dubious support for Gandalf's agenda. Their safest option is to earnestly try to support Gandalf's agenda, but to offer only information they know to be factual from first-hand, concrete evidence. If Bilbo has earned the loyalty of his subordinates, they will likely be grateful for this advice. Would you like to see your comments posted here? rbrendkKhsbUjnvEJIBabner@ChacSRdMkQRmBxCRYVvOoCanyon.comSend me your comments by email, or by Web form. I offer email and telephone coaching at both corporate and individual rates. Contact Rick for details at rbrenQzjbrgRTUTeOECQKner@ChacYxCWajjKuFJIkQBwoCanyon.com or (650) 787-6475, or toll-free in the continental US at (866) 378-5470.